I don't use the word "wise" very often, but that's how the author and her book strikes me. My son is not quite two, and I imagine that I'll be dipping into this book many times over the years to remind myself of key points and fortify myself for battles at home. I'm a non-practicing Jew who grew up observant. This book was recommended to me by a Christian friend, and I was pretty resistant to the idea of reading a book informed by Jewish tradition and law. After all, that's exactly what I have chosen to walk away from as an adult. Well, I'm here to tell you now that Jewish or not, religious or not, there's a lot of meat in a small number of pages in this is book, and nearly all of it resonated with me. Whether it's guidance about establishing authority, recognizing that your child is not your masterpiece, or resisting the pressure to push your child to perfection, Dr. Mogel has strong words for parents. She also has much to say about valuing time, valuing chores, and valuing your marriage or partnership (if you are in one) while you rear your children. Another theme that hit home with me was respect: respecting the opinion and advice of grandparents, teachers, and other parents; respecting your child in the way you parent him or her in all aspects; and respecting your own strengths, needs, and limitations. The overwhelming majority of readers of this book I know of have found it to be a wise, practical guide to better parenting. They found it replete with ways of making their child more respectful, self- reliant children as preparation to becoming better and stronger human beings. There was only one person whose negative criticism raised a question in my mind, and this in regard to the authors' treatment of children who suffer special disabilities. In any case I found that there was already a certain wisdom and direction in the way the contents of the book are structured. The reader opens with a chapter on the way she changed her whole practice of counseling children. She then has a chapter teaching parents how to accept the special character of their children. Her idea is basically that we should not simply take children as if they are blank slates in which parents write out their own needs and wishes. But rather each is a unique human being whose special qualities we must understand and help develop in a way best for them. (This accords with the traditional Jewish saying "Educate the child according to its nature") She too teaches the danger of over- protecting children.This is the focus of the title- chapter on the blessings of a skinned knee. She then considers the whole question of how we can find in ordinary decisions sparks of spirituality . She goes on to talk about the blessing of longing , and how important it is to teach children gratitude for what they have received. One of the main messages of the book is teaching children to overcome that kind of mentality in which they are perpetually hungry and dissastified, always looking selfishly for the next treat they can get. Mogel aims to teach parents how to teach Moderation in regard to physical demands, and appreciation for Good received. This connects up with the chapter in which she deals with the traditional Jewish terms for motivation ( Yetzer Hara- The Evil Impulse) and how children need to be taught how to use their drives in a beneficial way . She also speaks about Moderation in relation to food . In her last chapters she moves to more purely spiritual considerations, and teaches how parents should help in teaching their children Faith in God. While much of the Teaching here has its basis in traditional Jewish teachings about raising children it is clear that the work has a universal meaning and application. I had very mixed feelings about this book. On the one hand, I agree with the author's premise that parents should be parents, and not try to be their child's best friend. On the other hand, some of her other arguments were very troubling to me. Among these were the idea that you should never be an advocate for your child, and that you should allow him to handle all his problems himself. The author fails to account for the fact that young children lack the experience and the skills necessary to cope with every situation; that's why they HAVE parents! Not every bad experience is a "learning experience," and I think some of the advice in this book advocates a parenting style that borders on neglect. Perhaps this is because Dr. Mogel is a therapist in an affluent Beverly Hills neighborhood, and she simply doesn't see kids with "real problems." Additionally, she states that parents should not expect their children to be good at everything. This is obviously good advice, but then she goes on to talk about how terrible it is that girls in the modern era are supposed to be good at math and science. Exactly what is she trying to get at here? That girls shouldn't be encouraged to do well in "non-traditional" subjects? Indeed, this does seem to be what she is saying. Finally, one of the most disturbing anecdotes in this book is about a young girl who is so anxious about going away to camp that she repeatedly throws up all night long. Dr. Mogel holds this up as a great example, because the parents make her go anyway. If you are making your kid so anxious and stressed that she throws up all night, YOU ARE NOT DOING A GOOD JOB AS A PARENT. THIS IS NOT OKAY. In sum, I would say that her underlying message, which is to parent your children and not let them run the show, is a good one. But many of her examples are distressing to say the least. And finally, she never gives any advice as to how to implement her philosophy. For example, if she says, "don't let your kid do X," she never gives any strategies for how to deal with it when your kid inevitably does X. Based on Torah examples she show us how to get involve with our kids, and create a great relation. What can one say? This book touches very succinctly on how we raise children, and how we might do it better. Based on teachings of Judaism. No, this book does not try to convert you, so any anti-semetics need not fear the read. (Even our drunk and ranting movie star of 2006.) I am contently Christian and am thoroughly religion-tolerant, perhaps with the sole exception of fanatical Catholicism. And I found this book fascinating. 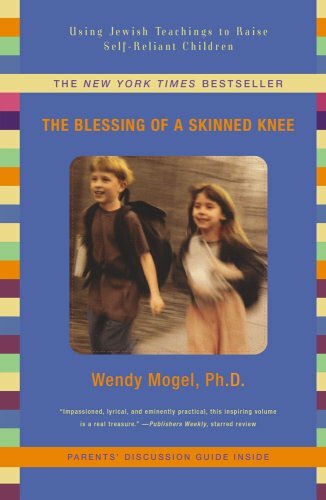 Neither a parenting book nor a religious tract, "The Blessing of a Skinned Knee" still provides useful lessons in both areas. Its message is that children have the potential to be surprisingly wise and noble and inspiring, but they must be helped along by a firm, respectful, and commanding adult presence. The teachings of Judaism are used to show how a balanced, meaning-focused approach to family life (as opposed to the hedonistic MTV lifestyle or the hectic, achievement-oriented lifestyle of many suburban families) can bring both parents and children to a higher spiritual level while also helping them get along with each other - and themselves. I am not Jewish, but still found this book extremely relevant to my own parenting. Although Dr. Mogel uses Judaism and Hebrew as a basis for the underlying structure of her presentation, the issues she raises can be applied to any children and any faith. I found it refreshing to read a parenting book that actually tells you that your child may not be above average and as a parent it is your responsibility to nurture your child's own unique traits and talents--not try to mold them into the next nobel laureate. As she quotes a Hassidic saying, "If your child has a talent to be a baker, don't tell him to be a doctor." As the title of the book implies, Dr. Mogel also suggests that it's okay for your children to be exposed to hurt and other unpleasantries of life. She chooses to call these "blessings" and her chapters include titles such as " The Blessing of Longing, The Blessing of Work, The Blessing of Self-Control, and The Blessing of Time." The book also heavily emphasizes the importance of tradition in family. Dr. Mogel does this through the practice of Judaism and using the traditions of Judaism to bind her family together. I think this concept can be applied to any religion, or if not a religion than a series of ongoing family traditions that bind your family together. Written by a psychiatrist who was frustrated by the answers she found in the medical books, this book reminds me of things that are so easy to forget. Given to me by a non-Jewish friend, this book does not rely on religious dogma to get its point across. It is about wisdom our great-grandparents knew but that we, in our technology-driven, everyone is special, achievement oriented society, have lost. The book is easy to read without being cartoony like other parenting books. It is organized perfectly into chapters that include a few examples and instructions without being listy or bossy. I have a two-year-old and I am starting to glimpse the difference between my expectations of what my daughter is supposed to become and what her personality is. This book is reminding me that children are not things to be molded but are people to be unfolded. I wish that every parent would read it so that we can raise healthy children together. The Blessing of a Skinned Knee: Using Jewish Teachings to Raise Self-Reliant Children. The Blessing of a Skinned Knee: Using Jewish Teachings to Raise Self-Reliant Children. Wendy Mogel, 2001, 304 pages. When our Cadets came back from The Leader Development and Assessment Course a few of them complained that the hardest part of the course was being "bubble wrapped". This "bubble wrapping" created a risk adverse mentality and did not promote resiliency. Bubble wrapping a child is the underlying sub-text of the book, "The Blessing of a Skinned Knee: Using Jewish Teachings to Raise Self-Reliant Children". The author is not a proponent of physical, spiritual, or emotional "bubble wrapping". Not that the author advocates a completely hands off "Lord of the Flies" type of parenting style. Rather the author advocates providing the structure for children to grow and learn acknowledging that there will be falls, bruises, and spills. The goal of a parent in her vision is to teach resiliency so that the child has experience in choices, consequences, success, and limitations by the time they leave the parental nest and venture out on their own. The end state goal is a self-reliant, resilient adult. This book like most good parenting tomes is not a specific matrix to follow or an iron clad situational cause and effect program. A book of that type would be antagonistic to the over all concept of this book. Too often I have noticed that parents pick up these type of books looking for a quick fix or silver bullet to solve a parenting issue that the are having. People get caught up in the exact how and bypass the why and what. This book is about providing a guiding structure or underpinning guidance. To that end the book is a valuable tool and I can recommend it. The Jewishness of the text is not an obstacle unless the reader chooses to make it an obstacle. Much of the Jewsihness is encapsulated in two methods. The first is the use of pithy but relevant quotes and observations from the Talmud. The bulk of these observations are non-religious and merely life observations. The second encapsulated method is the advocacy of Friday night Shabbat diner. If the reader understand the why and the what than it becomes merely a ritualized family diner and time. The ritual is in the parameters and not in the faith process. I have seen and listened to many parents who `bubble wrap" their children. Most often this protective padding is related not to physical aspects but to emotional or freedom aspects. When you routinely make your child's choices for them they do not learn how to make their own choices. What you create is a fragile clone of yourself which is liable to snap and shatter because it is not a real self-owned person. It is an unfortunate cultural truth that we American Jews often treat our kids like fine, hot-house flowers - delicate creatures with frail egos, in constant need of support and nurturing, lest they wilt under the strain of everyday living. This author's wise reflections on parenting demonstrate that trying to iron out any difficulties our children may face in life - now and in the future - actually hinders their development, producing offspring that have far less initiative, resilience, and character than they should! And it's true! Lately I avoid going to my daughter's soccer matches, because it's too silly to watch the field flood with doctors, lawyers, and therapists every time a kid makes contact with the ball! The author of this very useful book offers wonderfully concrete advice about finding a way to lovingly reassert our moral authority and spiritual mentorship over our children. As a mother of four, living in the same city and cultural/religious milieu as the author, I am impressed with her thoroughness in covering this topic, her compassion for both parents and children, and her knowledge of ancient and contemporary Jewish parenting literature. But most of all, I am impressed by the frank, realistic, and practical steps she offers parents (Jewish or not) for helping their children find strength - true moral, spiritual and psychological strength - in who they are as individuals. Raising a healthy family in today's world is challenging for even the most insightful of parents. The Blessings of a Skinned Knee provides psychological and spiritual wisdom as well as practical guidance and parenting skills to enable every parent to succeed in creating a healthy and happy home. This book belongs on every parent's nightstand! As a mother of two teenagers and a Jewish educator and author, I found much wisdom, guidance and yes, comfort, in the pages of Wendy Mogel's book. She succinctly articulates that three fundamental principles which are at the foundation of much of Jewish living - moderation, celebration and santification - are essential tools in healthy, successful parenting. In raising our children with this in mind, we can help them on their path to becoming good human beings who feel good about themselves. I suppose it was inevitable in an era of neo-cons and Jewish Republicans that someone would write a Jewish "spare the rod, spoil the child" book to stand alongside Babywise and James Dobson. Mogel is more nuanced than the previous generation of authoritarian authors, but her message is the same. It's all about forceful control of behavior, under the misapprehension that an obedient child is a healthy child. In one passage on establishing parental dominance, she draws an analogy between children and dogs, suggesting that parents should intimidate children into submission the same way a dog trainer does with animals. Suggested punishments consistently lack a compassionate sense of proportion. How can threatening to put your child outside and alone in the dark possibly be an appropriate response to a kid refusing to brush her teeth at night? (I kid you not - this is exactly what she suggests on page 149). Parents terrorizing children keeps the therapy biz thriving, but you'll find examples every 20 pages or so in this book. There is a place for tough love. The challenge of parenting is knowing where and when to apply it. Wise parenting is a balancing act, but this book pushes all the weights to on one side of the scale with no sense of when it's gone too far. Smart, loving parents learn when to stand by their guns and when to compromise. But this book is all about the guns with no compromise in sight. Negotiation, the ability to parlay a difficult situation into a livable compromise, is presented as a liability rather than an essential life skill (i.e. if you negotiate with your kid, or vice-versa, you must be doing something wrong). The Jewish content was also disappointing. I borrowed the book hoping to find some insight into the difficulties of raising religious kids. How do you bring children to love Torah and tradition, even when the tradition is sometimes difficult? But this book is not about raising Jewish kids (per se) at all. The author uses Judaism only as a kind of folklore, a database of quotes to add some color to the text. The Judaism I love involves Jews who argue with God, who ask the difficult questions--smart, restless, kvetchy, inquisitive. You won't find those kind of Jews in this book, unless they're on the receiving end of a punishment. So what can I say that has not been said? This is a great little book! So I'll highlight some issues she brings up that I hope will catch your attention enough to investigate it. I appreciate her point about children's freedom. Most people don't realize that statistically speaking, children are FAR more likely to be hurt/killed automobile accident than they are by being abducted by a stranger (Most kids who are hurt by others are harmed by family), and that the rate of crimes against children has NOT increased in the past 30 years. And yet so many of us behave as if our children can not be unsupervised for a second--can not walk the dog, kick a ball around in a field or ride their bike to the pool. This is really wrong, and as the author notes, robs children of the best part of childhood to appease our own irrational fantasies. We SHOULD be shaking in our boots that our car will be hit by an SUV when our child is in it, but we don't think twice about taking our kids for a drive. Lastly, I loved her emphasis on letting the child experience making choices and experiencing relatively low cost consequences. For example, if a child chooses to have a messy room, don't help them find things that get buried, or go in to fetch the laundry from the floor. Letting them experiencing the natural consequences for thier choices is far more powerful than a million lectures. And later on, if your teen sleeps in class/dosen't do homework/skips school, don't rush in to blame the teacher--make the kid take responsibility and give him the dignity of learning to solve his own problems! It shows that I'm a former teacher here, and I loved what she had to say about supporting your child's education by supporting their character development. Amazing resource for parents and educators alike! As a parent of two children, who happen to have mild to moderate disabilites, interested in bringing Judaism more into their lives, I was very eager to read this book. I scanned the index to see what Mogel might have written for parents of children with disabilites and found nothing, but assumed that the issue must have been woven throughout the book. Afterall, Mogel is a child psychologist who, apparently, has had experience with children who have significant challenges. "There's a Jewish blessing that is said when one sees exceptionally beautiful people or things: 'Blessed are you, Lord our God, who has such in his universe.' And there is one to say when noticing strange-looking people or animals: 'Blessed are you, Lord our God, who varies creation.'" She then goes on to describe a chance encounter with a group of "what the Israelis called 'special people' (mentally retarded and physically handicapped adults)....."
Her description of this group of people, I feel, is all but freakish and completely lacking respect for their humanity. She writes "In America, we often keep such people separate. Although we let children see horror movies, we protect them from seeing real people who look scary and act inappropriately." While she commends the Isaelis for honoring these people by giving them a holiday, she does nothing but itemize the many ways in which they looked or acted bizarrely. And she even admits that, beforehand, she would have shielded her children from "these people whom God had made so very different. Ultimately, I felt grateful that my daughters had an opportunity to learn more about the variety of life than they ever could at home. When we protect our children from people who are different, inappropriate, and even frightening, they'll be too easily shocked and frightened as adults." So, I am to gather, that the benefit of this experience for her children was a kind of "desensitization". There was no mention of understanding people who are different or seeing their beauty. The idea, I felt, was that it is better to get the horror over with when they're young so they won't be horrified when they're older. However, people with disabilites, like everybody else, want to be accepted for who they are not what they represent. While feelings of discomfort are common and certainly not to be denied, Mogel conveyed nothing more in this passage about people with disabilities than that these people were other. I expected more from somebody writing from a religious perspective. Perhaps the book contains kinder passages about people with disabilities later on, but I had to put the book down after this. Instead of this book I highly recommend "How to Be a Jewish Parent" (by Anita Diamant with Karen Kushner). In addition to being a good book overall, Diamant includes a respectful and intelligent chapter on special needs children. Perhaps Diamant, unlike Mogel, understood that people with disabilities are everywhere and that their parents, like other parents, may just be interested in reading a book on raising their children in the Jewish tradition. This book had been recomended to me by many people. I was shocked at how biased it was and how it used the most anecdotal evidence to support its views. The author points out that there are gender differences between boys and girls and then uses that to support her contention that girls shouldn't be encouraged to excell at traditional "boy" things, like science. Yet, real educational studies show that girls who are encouraged in these areas do very well. I find I don't come down solidly on either side of the argument between putting children's needs first or maintaining a more traditional strict discipline, denying kids' their wants to build character. I think of the former as the theory promoted by La Leche League, and I do feel that kids have legitimate needs, and those needs should be acknowledged and met. This book provided a good counter balance to the La Leche League approach, and helped me see where, at times, a more strict approach to withholding some priviledges is beneficial in the long run. "Skinned Knee" is more than just a blessing. This is a book that will challenge parents of young children to examine the nature and basis of their parenting skills. Dr. Mogel has crafted an amazing book. One that is completely accessible and honest and, at the same time, one that may rock your own understanding of what it takes to be a good and effective parent. I came away from my first reading of this book with a profound sense of what was missing in my relationship to my two daughters. As a Jew slowly returning to practice of Judaism, I was asking my children to believe in things that I wasn't completely comfortable with-and they could see it in my actions and hear it in my voice. The wisdom of Jewish thought through the ages can be a remarkable tool in raising your children. Like most tools, though, this is a challenging one to learn and a difficult one to master. Dr. Mogel has shown in this book to be a wonderful rebbe (teacher) -- one with the head, heart and soul necessary to set each parent on the right path. I just finished this last night, and I plan to go back through it again. It's one of the better books on raising children that I've ever read. Mogel is a child psychologist with a definite slant--for her, a lot of the answers to parenting problems lie in encouraging spiritual growth, in ourselves and in our children. You don't have to be Jewish to find great material in this book--I'm not--but you definitely need to accept the premise that human beings are happier in a spiritually enriched environment. I have already started implementing some of Mogel's suggestions for fostering responsibility in children and encouraging them to be grateful for what they have (as opposed to constantly needing more to be satisfied). Moreover, I mean to stay mindful of her emphasis on a parent's need to accept a child's basic nature. If you can name the personality trait in your child that drives you insane, Mogel says, you have already named his greatest strength. Helping to raise him to his greatest potential involves teaching him how to utilize his nature, not how to subvert it. Unlike some modern psychological parenting texts, _The Blessing of a Skinned Knee_ doesn't pretend that children are blank slates to be filled with whatever we please. Instead, Mogel offers practical suggestions for working with the material we're given. One of the elements of the book that I would most share with my friends involves discipline. Mogel breaks down transgressions by intent and offers concrete ways to deal with them compassionately and calmly. She several times references Biblical exhortations to discipline--not in a pro-spanking stance, but in reminding parents that this is a responsibility that comes with the territory. I wish that some of the more stern parents of my acquaintance would read her arguments against shaming children. Mogel does not believe that discipline requires humiliation. Those who swing the other way--me included--could benefit from her section on restitution. My 8-year-old suffers an overly developed sense of guilt, and I am hoping that following her suggestions for restitution will allow him to feel a healthy sense of closure and relief.